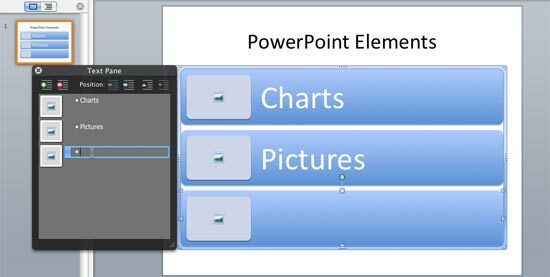 Excerpt/Capsule: Learn how the Text Pane can help you to insert and edit text in your SmartArt graphics in PowerPoint 2011 for Mac. 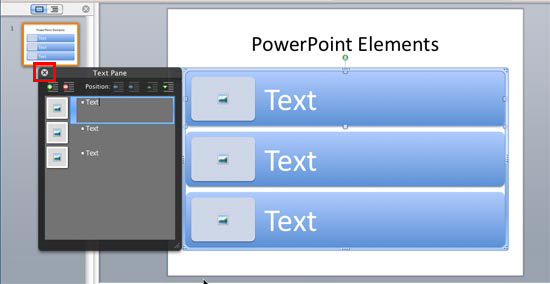 When a Smart Art graphic is inserted on the slide, you may or may not see the Text Pane. If you don't see the Text Pane, select the SmartArt graphic so that you can see the Text Pane icon, as highlighted in red in Figure 1. 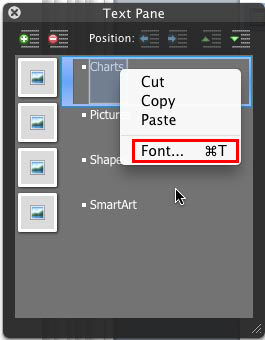 Click this icon to make the Text Pane visible on the left side of the SmartArt graphic, as shown below in Figure 2. Tip: At any point of time, you can close the Text Pane by clicking the x button on the top left corner of the Text Pane (highlighted in red in Figure 2). Within the Text Pane, start typing to add the text, as shown in Figure 3. You can also replace existing text. Whatever you type in the Text Pane is also reflected within the SmartArt graphic. 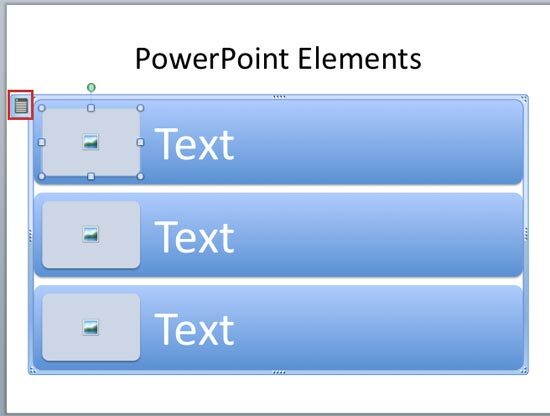 To create a new line of bulleted text in the Text Pane, just press the Return / Enter key. Type text, and you'll see that your SmartArt graphic has a new shape representing what you added, as shown in Figure 4. If you want to format the text in the Text Pane, first select the text to be edited. Then, carefully right-click to view the context menu shown in Figure 5. 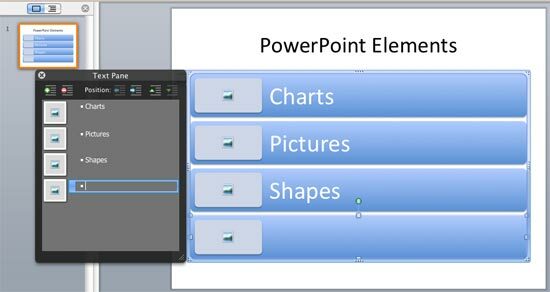 Note that the context menu includes the options to cut, copy and paste the selected text. Select the Font option (highlighted in red in the context menu in Figure 5 above) to make changes to font attributes. 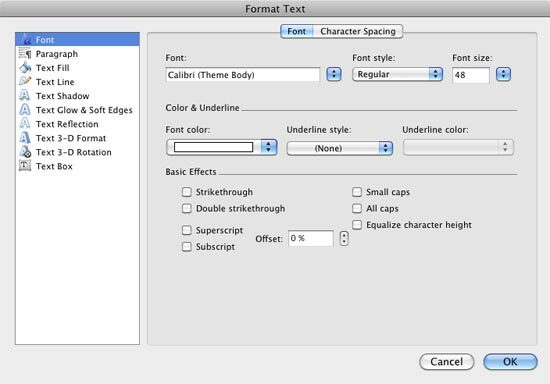 This will open the Format Text dialog box with Font tab active (see Figure 6). Here you can change the font, font color, etc. of the selected text within the Text Pane (and also within the SmartArt graphic). The Character Spacing tab enables you to adjust the spacing and placement of the same text. 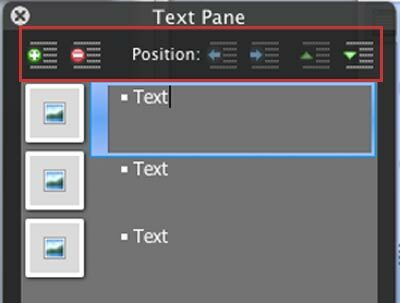 The Text Pane also includes six handy icons that allow you to change the hierarchy and position of the selected text to previous or next bullet levels (highlighted in red in Figure 7). Do note that these icons may be grayed out in some instances -- their availability in the Text Pane depends upon what type of SmartArt graphic variant you are working with. Add: This icon with a green plus sign adds a new bullet to the hierarchy relative to the shape that was selected before clicking the Add icon. Delete: This icon with a red minus sign removes selected bullet from the hierarchy. Decrease Indent: The left arrow icon takes the selected text to one level up. For example, if Decrease Indent is applied to a Bullet Level 2 text, it will be converted to Bullet Level 1 text. Increase Indent: The right arrow icon increases the indent (or reduces the hierarchy by one level) of the selected text to the lower level, applying that level's style and formatting. For example, Bullet Level 1 text will be changed to Bullet Level 2. Move Up: The up arrow icon moves the selected text up so that it appears before previous item. The text is moved up without making any changes to its hierarchy though. Move Down: The down arrow moves the selected text down so that it appears after next item. Again, the text is moved down without making any changes to its hierarchy. As mentioned above, some of the above icons might be grayed out depending upon the SmartArt graphic variant being used. For example you cannot add a new bullet level, or even a demoted level to the Basic Matrix SmartArt graphic once you hit the limit of 4 first level bullets (see Figure 8, the first icon, Add has been grayed out). Even if you try to add a new bullet by pressing Return key, you will see a cross mark in red as shown in Figure 8 indicating that the new bullet cannot be added . Some SmartArt graphic variants though let you add more bullets / shapes and are not as constrained as the Basic Matrix variant -- the Diverging Radial for instance lets you add many more bullets / shapes to an existing SmartArt graphic (see Figure 9 ).